What is the consumer meant to make of this? 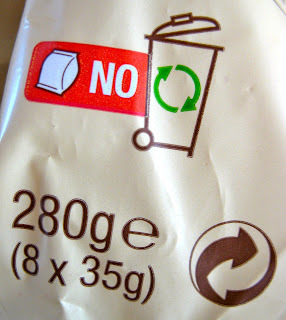 The Green Dot symbol (here brown) does not necessarily mean the packaging can be recycled, it is a fee paid licensed symbol indicating participation in packaging recovery and recycling by the manufacturer. Consumers, understandably, think it indicates a package is recyclable. So we end up with this: a Green Dot, a recycling bin with a green cyclic arrow, a paper bag symbol and to add total confusion a red NO! All that on some organic bakery products.